Alex the famous African Grey could identify seven colours, learned some of the alphabet and could count up to six. He also began learning to label objects from photographs. Both adults grey in colour with grey/white scalloping to feathers; flight feathers darker grey; red tail and lower undertail coverts. Bill black. Eye grey. As in adults but with grey tinged lower undertail coverts; tail tipped with red. Eye dark grey to black. Variety of whistles, squawks, shrieks, and screams given at rest and in flight; mimics other birds, and mammals. Macaulay Library, ML Media Collection Catalogue 1223, Grey Parrot (Psittacus erithacus),Kaestner, Peter, DR Congo Orientale, Dec. 4, 1977, Cornell Lab of Ornithology. Cooked beans and pulses, boiled corn, sunflower seed - dry, soaked or sprouted but limited; fruit such as: apple, orange, banana, pomegranate, pear; rearing food (hard boiled egg, wholegrain bread and carrot); vegetables such as: carrot, celery, green beans and peas in the pod; spray millet; complete kibble. 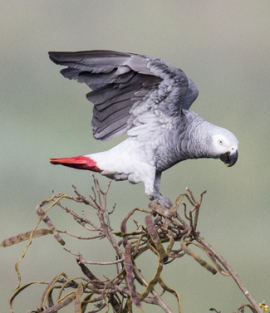 Formerly widespread over much of Africa, Grey parrots are now threatened throughout much of their natural range: extensive deforestation particularly in W Africa and heavy trapping for the wild bird trade have caused population declines, which have been noted in Burundi, Cameroon, Ghana, Kenya, Nigeria, Rwanda, São Tomé and Príncipe, Togo, Uganda and parts of Congo and the Democratic Republic of the Congo. Found in S Nigeria, S Central African Republic, Republic of Congo, DRC, Gabon, Equatorial Guinea, SE Ivory Coast, N Angola, S Democratic Republic of Congo, NW Tanzania, W Kenya, W Uganda, Principe and Bioko Islands. Found in primary and secondary rainforest, forest edges and clearings, gallery forest and mangroves; wooded savanna, cultivated land and some gardens. Found up to 2200m (7216 ft). Eats variety of seeds, nuts, fruits and berries and some cultivated maize. Feeds at tops of trees; gregarious, forming communal flocks which roost in palms over water or on islands in rivers. Disperses in smaller groups for feeding. 2 to 3 rounded ovate eggs, 39.5 x 31.0 mm (1.5 x 1.2 in). In E Africa January-February and June-July; in general in other areas a dry season breeder.